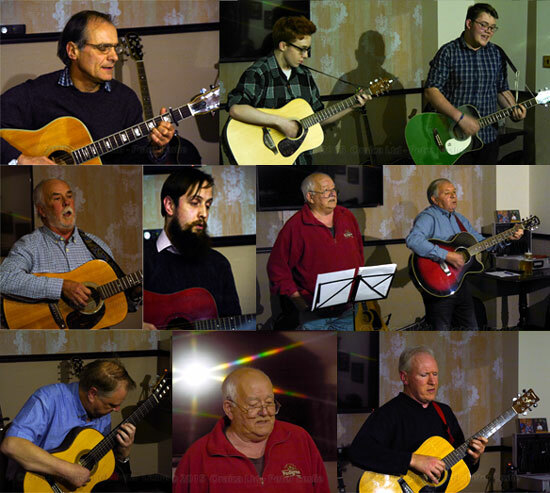 There has been a folk club in Wrexham since the early heydays of the folk revival in the mid 1960s and, with hardly a break, this has continued right up to the present day, albeit at different venues throughout the town and just outside. 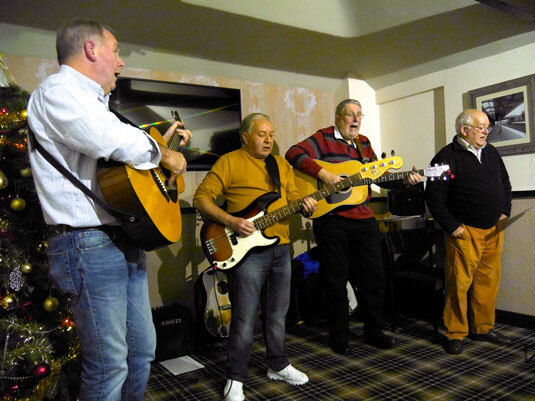 The other constant over the years has been that most, if not all of these clubs, have been run by a band, or some of its members, that has become synonymous with folk in the Wrexham and North Wales area, Yardarm. Even now the current resident band OFFA counts amongst its members one of the original founders of Yardarm, Goff Jones. The current home of the club for over 10 years has been The Nag's Head, Mount Street, Wrexham, a small friendly pub at the bottom of Mount Street and next door to the tall Wrexham Brewery Chimney, one of the historic landmarks of the town. The club meets on the first and third Thursdays of each month from October through to and including May with the exception of a break on the first Thursday in January. There are occasionally changes to this and it's always best to check the What's On page or on our Facebook page for confirmation. Our overall aim is to provide good music and, above all, an enjoyable and entertaining evening for all who come long and despite the word "club" there is no exclusivity here. The only membership you need is membership of the human race although we would not preclude welcoming the odd friendly "alien" either!!! Wrexham, the unofficial "Capital of North Wales" and home to the iconic landmark of St. Giles' Parish Church, is steeped in Welsh history and heritage. This old mining town saw tragedy in September 1934 at The Gresford Colliery when 266 men lost their lives. Within Wrexham County Borough Council boundaries is the site of Bersham Colliery, last to close in the area in 1986, and ironmaster John Wilkinson's Brymbo Steelworks, closed in 1990. Further afield, Shotton Steelworks is still open alongside the Dee estuary but very much diminished from the 1970s when 12,000 men worked there. Along the beautiful Dee valley is Thomas Telford's towering Pontcysyllte aqueduct, carrying the Llangollen canal above the river like a "stream in the sky". This and the nearby Chirk aqueduct were granted World Heritage status in 2009. Follow the winding road below and you come to Llangollen, home to the world-famous International Eisteddfod since 1947. Industrial, social and musical history all interwoven like some giant Welsh tapestry. 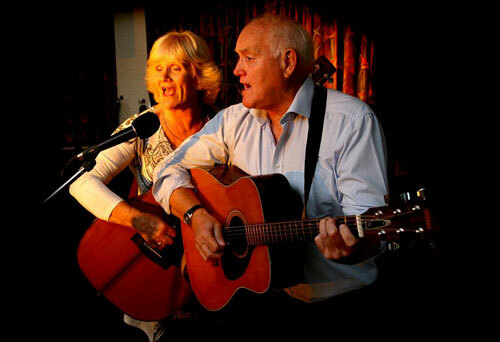 Many of the original songs in resident band Offa's repertoire reflect these 20th century changes and how they have affected the lives of the people of North Wales. Normally the first Thursday of the month, our guest nights feature high quality acts from all around the country and beyond. It is a real priviledge to be able to enjoy this level of entertainment in such an intimate atmosphere, and all the better because the performers invariably appreciate the atmosphere as much as the audience - an ideal recipe for a good night out. Previous guests include Archie Fisher, Dave Cousins, Brian Willoughby, Catherine Craig, Prelude, Allan Taylor, Harvey Andrews, The Houghton Weavers, Huw Williams, Jez Lowe, Barbara Dixon, Fred Wedlock, Jeremy Taylor, The Ronstadt Generation, Santa Cruz River Band, Julie Felix, Martin Carthy, Rod Clements, Hughie Jones, The Oyster Band, Rab Noakes, Kieran Halpin, Winter Wilson, Jonny Dyer & Vicky Swan, Stanley Accrington and Bernard Wrigley. On the third Thursdays of each month the club is thrown open for everyone and anyone to come along and perform, whether singing, playing an instrument or even reciting poetry or prose. It provides an amazing variety of music and entertainment and provides a platform for both younger and older musicians and singers to perform their songs, etc in a warm, informal and friendly atmosphere. Many a star of the music scene started in just this way and these nights can be surprisingly enjoyable. Admission on Singers' Nights is FREE although, in order to fund the club's guest nights, we do run a raffle and also "pass the hat" around later, leaving everyone to give as little or as much as they wish. On every club night the resident band commence the evening with a few songs before either the guest act or the "Singers" play their spots. The current band's new line-up is Goff Jones, Ken Prydderch and Geoff Jones (cello and double bass). Geoff played with Yardarm in 1972 for about 12 months and again in 1982/83 for a short period. He has played all sorts of music in his musical career including jazz and orchestral music. 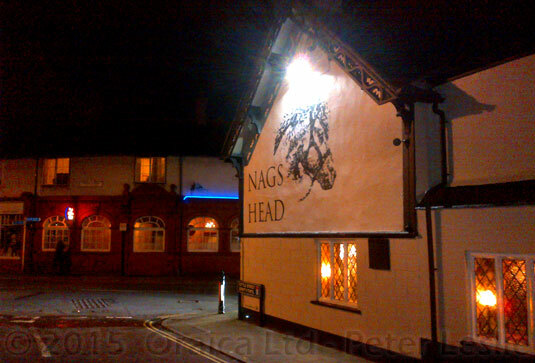 We are very fortunate to have The Nag's Head as our home. It is one of the most popular and well run pubs in Wrexham and offers good cask ales and excellent food. This makes it ideal to "make a night of it" by arriving early and having a meal before the club kicks off at 8.15pm. We are also fortunate to be able to run all events "unplugged" as the function room is upstairs, well away from the hustle and bustle of the pub. The room is legendary for its intimate atmosphere and excellent acoustics, with the only down side being the restriction on numbers. The absolute maximum is now fifty, which means it is more important than ever to reserve tickets for the guest nights as soon as possible. Keep abreast of developments on the What's On page. We also have event pages on Facebook so please "like" our Facebook Page.